We had a Dressage lesson last night, because it's finally too dark for my 7pm lesson to be outside and my trainer is in denial that it's time to bring poles and standards in from the outdoor and the field. This is 1) funny to me and 2) not a problem, because we could use a fancy prancing boot camp after all that jumping. 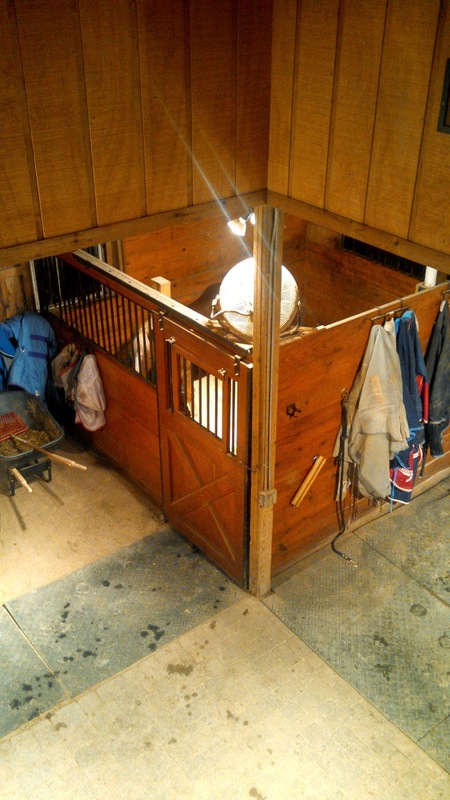 Connor moved stalls (happens all the time in our barn), and is now in the opposite corner. The theme of last night was getting his outside shoulder unstuck, especially to the right. He likes to pile all of his weight onto the inside shoulder, and then when I ask him to do things he's like "WHAT THAT'S NOT PHYSICALLY POSSIBLE" Well, it would be, if you didn't have all of your 800lbs on one foreleg, horse! To get this, we turned between the center and quarterline and did 3 steps of shoulder in, then three steps of leg yield, then 3 steps of shoulder in, then 3 steps of leg yield. At the walk both directions, then trot. One of the things she told me while standing in front of me in this exercise is that my right shoulder is always a little lower than the left, and to think about weighting my right seatbone and lengthening the right side of my body. Every time I did that, he traveled more evenly. Next we did basically the same thing, but with haunches in instead of shoulder in. This time, especially to the right, the (pseudo) leg yield really focused on opening with the outside rein in order to get him to lead with his shoulder (aka transfer the weight to his left shoulder). (Using the modified leg yield here as a means to an end, not practicing a proper leg yield for the sake of practicing a proper leg yield). Once I got his shoulder unstuck, she told me to ride the outside hind toward his inside ear, and the combination of both those things made for a really big change in his way of going. 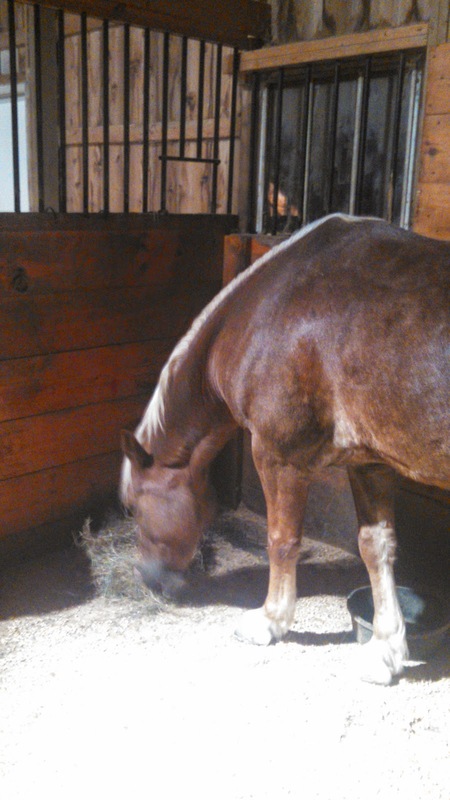 His weight shifted back and he became lighter and more consistent in the bridle. I need to find THAT on my own. We ended up with a few minutes of her calling out a different gait or lateral movement every couple of steps, and then throwing canter in that mix as well, and really trying to get canter to short trot and canter to walk. Canter to walk is hard right now - feels like a pile of limbs and hooves rattling around underneath me - and right now there are several trot steps there too. I can get fewer trot steps, but it's less balanced, so I decided to go for more trot steps and more balanced at this stage. It's all a progression. I kind of sort of love your trainer... and have fun clipping! Because she's in denial about winter or really good at what she does? Haha. Thanks! straightness is so tough....I have to bring my poles inside too - boo. I hate winter. Me too, though I'm sure you have it worse up north. Yeeeeep. I always say I'm about 6 weeks behind in my rides on my own vs what I can get in lessons. I have the clipping itch, but not so much the blanketing one. :-/ It will happen sooner than later. Yeah. I held off too long last year. Even one night of having wait 1.5-2 hours for him to dry is too much for both of us. I have a sheet this year, last year my lightest blanket was 100g, so that gives me some flexibility. Road trip? Haha. I wish I could get a blogger clinic together. It's hard to believe she's as young as she is (my age) for how well she can instruct. That sounds like a great lesson! It was really awesome. I want all the Dressage I can get right now. I second Lauren, but change the state to VA. Finding trainers like her is not always easy. No it is not, I definitely don't take her for granted. I don't aim to inspire envy, I'd like to think she does that herself. Haha. I understand. It's a small miracle that she's here in the middle of the midwestern United States.